Phoenix New Times is proud to announce the highly anticipated 18th Annual Best of Phoenix A’Fare presented by ACE Home Services. will be held on October 14 at Arizona Biltmore. The event will be held from 8-11pm, with VIP hour beginning at 7pm. Attendees are invited to celebrate the BEST OF PHOENIX 2017 by enjoying food, drinks and entertainment. The festivity will feature savory delights and decadent offerings by 40 outstanding, local restaurants including: European Bakery & Café, Flourish, San Francisco Chocolate Factory, Outrageous Olive Oils, Yasha from Russia, to name a few. Sponsors of this year’s event include: Stella Artois, Four Peaks, Tito’s Handmade Vodka, Gentleman Jack, Hornitos, White Claw, Aridus Wine Company, Renewal by Andersen, Baked Bros, Stacy’s @ Melrose, with more to come. 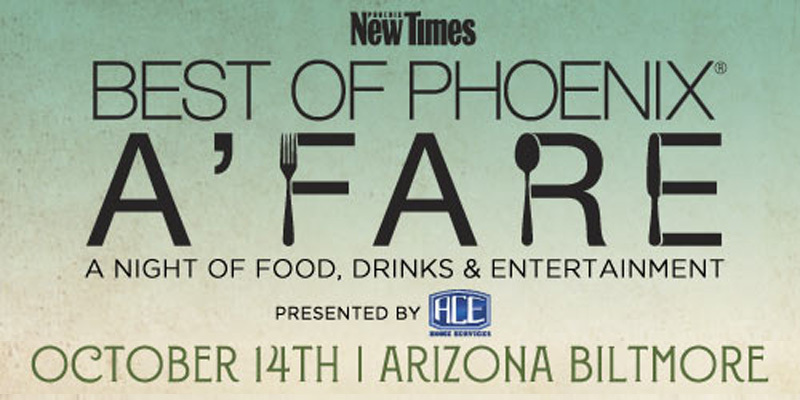 Presale tickets for Best of Phoenix A’fare go on sale at 10am on Tuesday, August 1. Tickets go on sale to the general public on Monday, August 7 at 10am. Go to http://ticketf.ly/2vdp1PJ, where you can use the code BEER to unlock the ticket types to purchase. General admission tickets will be available starting at $40 and include: entry into the event, samples of cuisine from participating restaurants, cocktails, wine & beer, and entertainment. A limited number of VIP admission tickets will be available starting at $60 and include: an hour early entry into the event at 7pm, VIP gift bag, samples of cuisine from participating restaurants, cocktails, wine & beer, and entertainment. A portion of this year’s Best of Phoenix A’fare proceeds benefit The Leukemia & Lymphoma Society. The mission of The Leukemia & Lymphoma Society (LLS) is to cure leukemia, lymphoma, Hodgkin’s disease and myoloma, and improve the quality of life of patients and their families. Since its founding in 1970, New Times has kept the Valley of the Sun’s feet to the fire. The paper began as an aggressive, irascible alternative to the stuffy mainstream media, which attacked “hippies” just as it now belittles millennials. And thanks to its early commitment to digital journalism, New Times draws more than 1 million monthly active users to its website, phoenixnewtimes.com. They’re joined by more than 200,000 weekly print readers who consider the paper an unparalleled source of information and insight, from politics and business to music and the arts. Along with its hard-hitting journalism, New Times produces some of Phoenix’s most popular live events. Its annual Best of Phoenix A’fare, tied to its popular annual “Best of Phoenix” issue, features cuisine from dozens of restaurants from all over the Valley, along with wine, cocktails, beer and entertainment. And at its annual NovemBEER Festival, nearly fifty local breweries serve up more than 100 beer options. The total package makes New Times a must-read for anyone interested in taking the temperature of the nation’s fifth- largest city.